This is the queen of large flowering shrubs, a fabulous plant that can be grown as a viney shrub or a shrubby vine - or even as a stunning tree. In all cases, the flower show is spectacular. 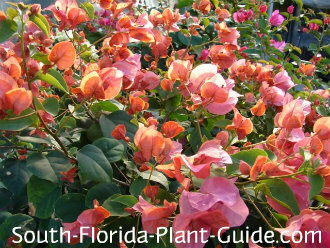 Available in a rainbow of color choices - red, pink, purple, white, orange, yellow, and many shades in between - this is one of the best Florida shrubs for year round color...especially in winter, when less things are generally in bloom. Yes it has thorns. And they can be vicious. But choosing the right area for planting - and wearing protective clothing and gloves when you handle this plant makes all the difference. All of the above (except for certain varieties). It just depends on how you grow it in your landscape. The colorful part is actually made up of flower bracts. The bloom itself is the tiny white blossom in the center of the brilliantly colored bracts. 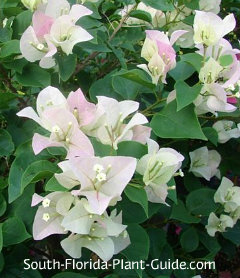 There are cultivars with variegated leaves, providing even more color interest even when the plant isn't blooming. Full sun, full sun, full sun. 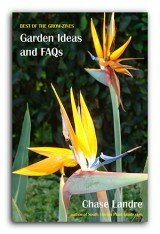 These are cold hardy plants that do very well in both Zone 9B and Zone 10. Bougies are drought-tolerant plants once established, and are moderately salt-tolerant as well. 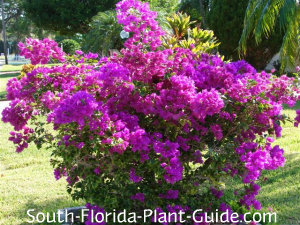 Regular bougainvillea care involves trimming after each bloom cycle and then fertilizing to promote new growth and new flowers. Trim each branch about 6 or 8 inches from the tip. Give the plant some fertilizer with bloom booster each time you do this "haircut" to encourage the next set of blossoms. To grow as a large hedge, place plants 4 or 5 feet apart. 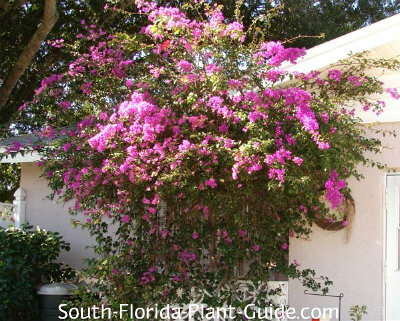 If you want to plant with other shrubs and flowers in a mixed bed, place it 5 feet away from the next plant. This is not only to preserve the nearby plant from being overtaken, but also to give you room to get to it for trimming. To use as a vine you'll need a support system like lattice against a structure, or a fence or arbor. In this case, you can plant close to whatever it's going to grow on. These plants do fine in large containers. COMPANION PLANT SUGGESTIONS: Carissa, plumbago, Texas sage, variegated pittisporum, muhly grass, clusia guttifera, and dwarf oleander.